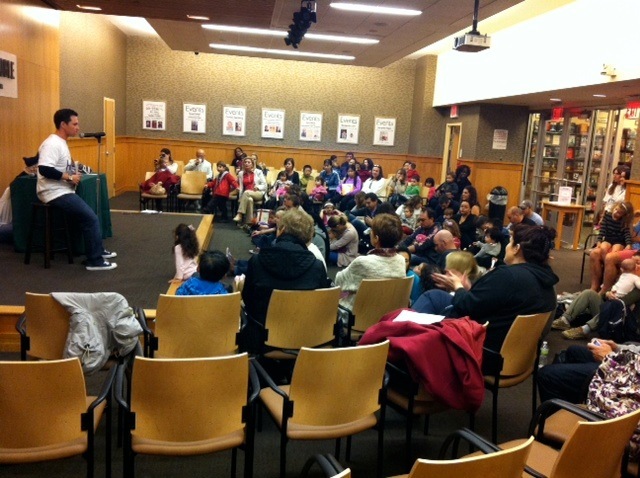 What a Great Turn-Out for Sunday Story-time! 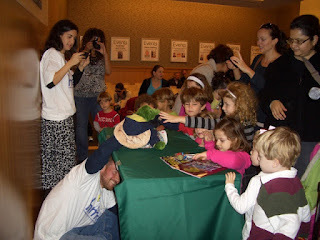 HMESF brought together author Richie Frieman, Terple the Turtle, and Fabipops for a fun Sunday Story-time! 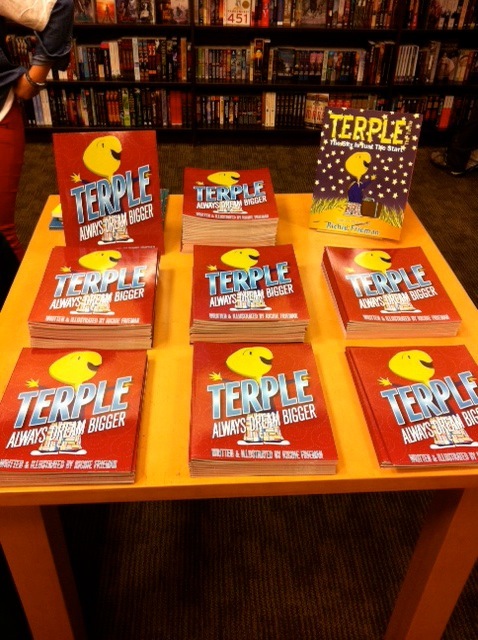 Yesterday the theater at Barnes and Noble on 86th Street and Lexington Ave was filled with children, toddlers, babies, parents, and grandparents eager to hear of Terple's adventures. Richie Frieman captivated story-timers from the beginning, getting the crowd involved to call for Terple to come out and join the show. Puppet Terple joined Richie Frieman on stage, after admitting to already eating 5 delicious Fabipops! We began story-time with the first book in the Terple series: Terple, introducing the imaginative and courageous young turtle dreaming of a life outside the pond. Moving onto the latest installment of the Terple series, Terple--Always Dream Bigger, Terple's parents write him a goodnight letter encouraging something all parents tell their children: you have to dream bigger if you want all your wishes to come true. Storytime was far from over when Riche Frieman finished reading his books; Terple brought magic stones from his pond to give to each child to foster their wishes and dreams.Terple even stayed around for a meet and greet with the children, answering all questions they could come up with. No one walked out empty handed. 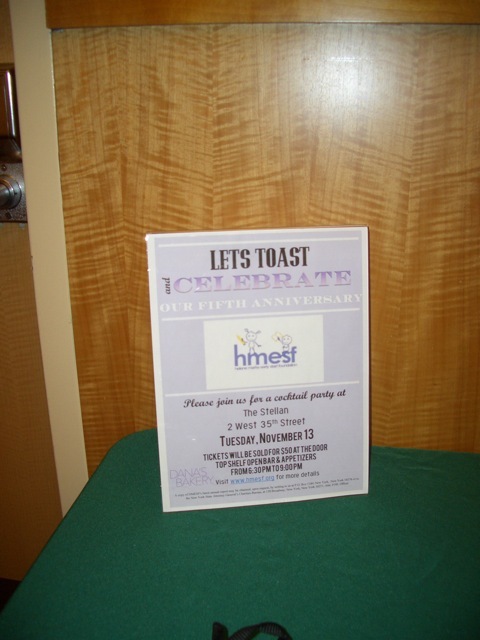 Every child received an HMESF sticker and a Fabipop-a fabulous cake pop-that looked just like Terple! Parents also left with more information about HMESF's mission dedicated to putting children in the forefront and invitations to our upcoming 5th anniversary party next month. For anyone who missed Sunday's Story-time, we can't send any Fabipops or stickers, but you can still participate in the Barnes and Noble book fair! Its an opportunity for our supporters to support the author and our cause. Shopping online at B&N until October 26th with a valid bookfair voucher* will allow 15% of all sales go back to HMESF! 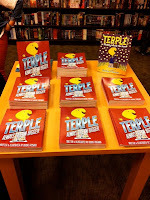 One more thing, Richie Frieman's Terple--Always Dream Bigger will be part of our book/kid donations to child care centers HMESF supports in New York City! 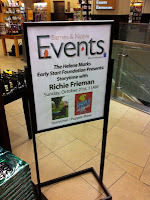 Check out photos from Sunday Storytime with Richie Frieman at the HMESF Facebook Page: Sunday Storytime Album! Stay tuned for additional information for our upcoming 5th Anniversary Celebration and other updates on our Facebook and Twitter ! *The Barnes & Noble Bookfair ID supporting HMESF is #10885242. On Saturday, October 13th the Terri Lynne Lokoff Childcare Foundation (TLLCCF,) held their annual Rose Gala at the Lafayette Ballroom in Philadelphia. This event annually celebrates improvements in early care and education. However, in lieu of TLLCCF's 25th year anniversary, they paid tribute to the memory and hard work of my mother, Helene Marks. At the event they debuted their new video which included a slide show of my mother in action. Allan Miller, the executive director, and Kay & Fred Lokoff, the founders of TLLCCF, presented my father and I with a plaque in honor of my mom. The night was bitter sweet for both my father and I. We are extremely proud of my moms work, and were thrilled to accept the 2013 "Terri Lynne Lokoff Child Care Advocate Award," on her behalf. Allan Miller, the current director kindly spoke about my moms work. He said, "what can I say about Child Care Advocate recipient Helene Marks? Helene was a tough cookie who was passionate about her family and about the kids and teachers we do our best to help. I came here as director 7-1/2 years ago looking forward to working with Helene. I knew I could teach her about the business side of things and she could teach me about never accepting, “No,” for an answer, about doggedly pursuing goals, about networking incessantly and about never turning down a request for help because, down the line, those she helped would in turn be inclined to help someone else or some other organization. Like Terri, I wish that Helene was still here so the TLLCCF and the Helene Marks Early Start Foundation- established by Helene’s daughter Jaime, would not have to act as her proxies." As long as I could remember, while my mom was the active director, she planned for months in preparation for the annual Rose Gala. It looks like she has passed the torch. I have gained a greater appreciation and understanding for what it takes to plan a momentous event, as we are gearing up for our 5 year anniversary of HMESF. It's an event you won't want to miss. Hope to see you there! 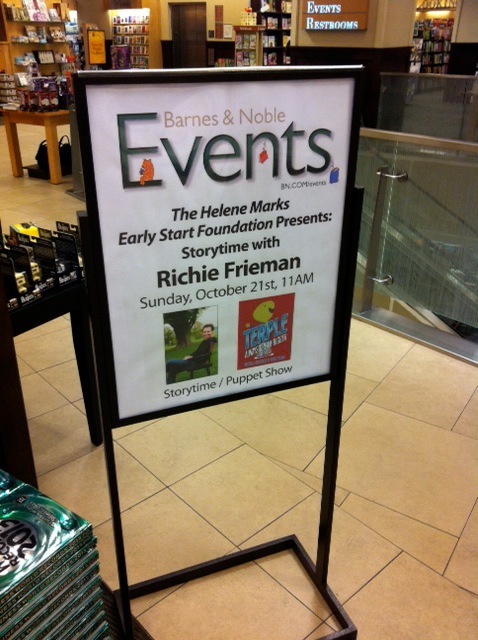 Three Days and Counting Until Sunday Storytime with Richie Frieman! If you don’t know already, HMESF is hosting a free reading event at the 86th Street Barnes and Noble. Children's author Richie Frieman will bring to life his delightful character Terple the Turtle with a special story time and puppet show! Awarded the Literary Classics Seal of Approval and the 2012 Gelett Burgess Children’s Book Award for Best Poetry and Rhyme book, Richie Frieman’s book will also be part of HMESF book/kid donations to child care centers in New York City. Terple--Always Dream Bigger will be sold at Sunday’s book reading and every child will receive a Fabipop--a fabulous cake pop! So if you’re in the area Sunday, drop by for storytime with our favorite turtle, a fabulous treat, and learn what's new with HMESF! *Supporters of the bookfair must present a valid bookfair voucher at the time of purchase. Up to 15% of all sales will go back to HMESF so help us reach our goal of $2,000! 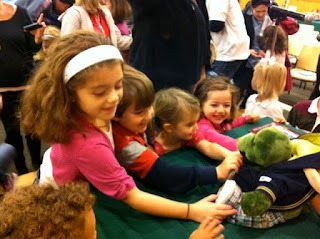 The Barnes & Noble Bookfair ID supporting the Helene Marks Early Start Foundation is #10885242. For our first round of Edu-Cap (Education News Recap), we wanted to shine light on a few stories we’ve been following for the past two week in New York City. This Edu-Cap highlights few news stories surrounding Mayor Bloomberg’s initiative to change early child care and education and how current operating care centers are adjusting in NYC. Specifically the Washington Heights Child Care Center faced closing their doors last month. The center provided subsidized child care to poor and working families in financial struggle. Despite serving the low-income community and families in the neighborhood for 42 years, funding cuts from the city pushed the nonprofit provider into a corner. A month ago, the center faced decisions to either find more donations, appeal to the City Council for funds, raise parental fees, or even close. The deadline was September 28 to find additional funding or close its doors. For a more read Washington Heights daycare center averts shutdown. The Washington Heights Child Care Center is not the only child care center struggling in these times.More than half of uptown child care centers lost their government contracts this month to provide subsidized child care for New York’s low-income families. Without the funding, 23 centers in Harlem, Washington Heights and Inwood are in trouble and face decisions similar to Washington Heights Child Care Center to find additional donations, funding, or to close. With these changing policies and funding-cuts, we can only imagine the struggle of these child care providers. Yet the concern here is while the City Council was able to swoop in at the last minute to rescue Washington Heights Child Care Center, that funding ends in June. So what then?